Today I welcome author T D Thomas to the blog to talk about Greek Gods and his book, Hera: Queen of Gods. WWGGD: What Would the Greek Gods Do? Everyone knows the catchphrase, WWXD or “What Would X Do?” where (if I can get a bit algebraic here), X = basically anyone or anything you can think of. Phrases like this are called “snowclones:” linguistic versions of Internet memes. You take a phrase (e.g. One Does Not Simply Walk into Mordor) and replace one of the words (e.g. Mordor) with something else (e.g. Biology class late) to make a new phrase: “One Does Not Simply Walk into Biology class late.” Voila. A snowclone. I thought it might be fun to make my own snowclone: WWGGD. What would the Greek Gods Do? Now, for those who haven’t read my book yet, the Fates are kidnapped, and the Greek gods come to the mortal world in the bodies of teens to save them. As you can imagine, various hijinks ensue, mostly of the monster-bashing, world-saving variety. Unfortunately, the gods are too busy fighting off the apocalypse to really appreciate what it’s like to be a mortal in high school. But what if the gods weren’t here to save the world? What if they had to do something much worse? Like live through high school. Without any powers. 1) Pop Quiz in History class! • Hera: Nails it. Wasn’t paying any attention in class, but remembers a lot of history, having witnessed it while it was happening. Gets one or two questions wrong, but argues the teacher into believing she’s right. • Zeus: Fails it. Suggests to the teacher that he could really benefit from some personal tutoring. Very personal. Somewhere private. • Demeter: Fails it. Too busy staring out the window, daydreaming. Willing to earn extra credit, preferably with something outdoorsy like a historical re-enactment. • Hermes: Passes. Cheats to avoid failing, but smart enough to leave a few wrong answers so it won’t be too obvious. • Athena: Nails it before all the tests are even handed out. Spends the rest of the time trying to help Zeus cheat, but he’s too busy making eyes at the teacher. Then, goes back through the test, estimates how many questions Hera might get wrong, and changes enough answers so Hera beats her on the test. • Artemis: Passes. Nails the questions on battles and wars. Skips the rest. Way too boring. Doesn’t care how she did anyway. Only attends class to keep an eye on the others. • Apollo: Passes. Next to one word answers, sketches amazingly detailed historical scenes and portraits. Saved by getting half-marks for his breathtaking doodles. 2) Cafeteria Disaster: Ketchup vs Shirt! • Hera: Stands up. Strides to the bathroom, head held high, with Demeter and Artemis close behind. Gets one of them to fetch her a clean shirt from her gym bag. Or their gym bag. Frankly, doesn’t care where the clean shirt comes from. • Zeus: Grins. Stands up as loudly as he can and then pulls off his shirt. Lets everybody drink in his physique. Then sits down and keeps eating, shirtless. • Demeter: Laughs. Wipes off the ketchup. Keeps eating. • Hermes: Nobody notices. His shirt is cleaned off and dried before anyone even looks at him twice. • Athena: Creates a perfect stain remover with salt, soda, and whatever else happens to be on the table. By the time she’s finished, her shirt is actually cleaner than before. • Artemis: Ignores it. Keeps eating. • Apollo: Takes the ketchup and blots it all over his shirt, creating a pattern. Throughout the afternoon, complimented on his cool, new shirt. • Hera: Exudes confidence, but only does passably well. Refuses to join when offered a spot as an alternate, since it’s clear she doesn’t excel at sports. Offers to get corporate sponsors and organize a charity fundraiser for the athletic department instead. • Zeus: Doesn’t have to try out. Offered a spot the moment the coach looks at him. Insists on doing tryouts anyway, just for fun, but unintentionally intimidates the other side into throwing the game. • Demeter: Doesn’t make it onto any teams. Doesn’t care. So enthusiastic that she’s encouraged to try out for cheerleading instead. • Hermes: Clowns around and fails miserably. Makes everyone laugh . Encouraged to try out as team mascot instead. • Athena: Informs everyone that she’s trying out for coach’s assistant, not to join a team. Promptly analyzes the strengths and weakness of each player, and develops several strategies to take advantage of them. Offered a job on the spot. • Artemis: Stuns everyone with her athletic prowess, then disappoints them by refusing to join any team sports. Joins track and field instead. • Apollo: Misses tryouts. Too busy finishing a sculpture in Art class. Feels badly and offers to design a modern logo for the team to replace their outdated one. And that’s what the Greek Gods might do! As queen of the gods, Hera has no choice: she must lead a handful of gods to the human world to search for the missing goddesses, even though it means temporarily giving up her divine powers and borrowing the body of a mortal girl. 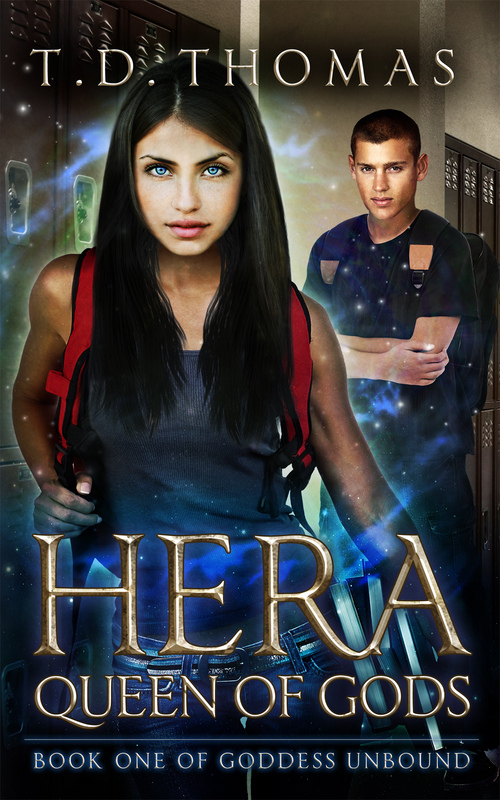 But mortality begins to change Hera in unexpected ways, and it gets much worse after she meets Justin, a boy who defies every prejudice she once had about mortals. Torn between who she's becoming and who she needs to be in order to fulfill her duty, Hera must survive a horde of murderous creatures sent to exploit her new mortality. In the end, only she can stop a traitorous plot conceived by a secret alliance of ancient and new enemies, a plot that threatens to destroy all of existence itself. This fast-paced, action-packed adventure plunges you into a world of myth, monsters, and magic, where no one is safe and nothing is what it seems. When he's not battling to save Azeroth from its latest calamity, T.D. Thomas lives with six of his closest friends in a tiny house in the frosty north known as Canada. There, they are all ruled over by a little white dog named Teo, who firmly believes he's a reincarnated Egyptian pharaoh and demands to be treated as such. T.D. 's favourite things include personal space, temperatures above 0 degrees Celsius, and cats who don't take guff from pretentious little white dogs. If you love myths, monsters, and magic, check out his debut contemporary fantasy novel, “Hera, Queen of Gods,” on Amazon!